MaryFran Simply...: Who Doesn't Love Zebras! 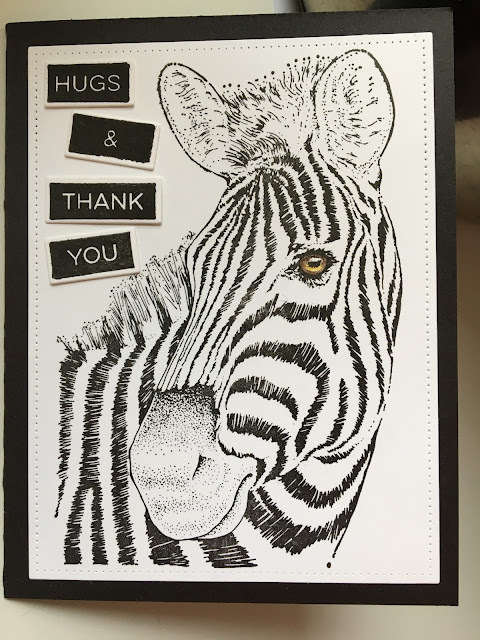 Hello there, I'm in the zone today and have a card for the Penny Black Challenge called Feature A Creature and the Simon Says Stamp National Craft Challenge as well. This is a new stamp I saw at a stamp expo in Rockford, Illinois and one of those, 'gotta have' stamps. To create this very quick A2 card I stamped this guy onto some white card stock and actually just colored his eye! I googled zebra eyes so that I could get a good feel for it and I'm glad I did, I would have done a big brown eye not realizing they have a few different browns (which I blended with water). I die cut the panel, cut the sentiment blocks, and adhered all onto a black card stock. Voila!! Thank you for reading and the materials used are listed below. SO striking! That's a great image. Such a super Giraffe and lovely creation, thanks so much for joining in with out 'Feature a Creature' theme at Penny Black and More challenge. It would also fir in very nicely at our Sister challenge Allsorts.